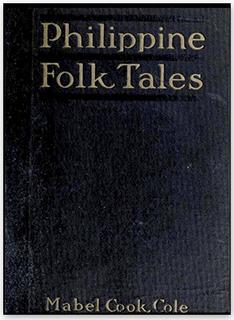 Original cover of Philippine Folk Tales, 1916. Mabel Cook Cole was an anthropologist and author. Her collection Philippine Folk Tales, published in 1916, was Cole’s attempt to make a thorough compilation of folk tales from the nation. Prior to the book’s publication, tales from the Philippines have been printed in scientific publications, but these volumes weren’t for general public consumption. The author’s husband was an ethnologist for the Field Museum of Natural History, and the couple spent four years with the “wild tribes of the Philippines.” They were privy to hearing these tales while sitting around a campfire or visiting with people, and put them down in print for posterity. Cole’s tales shares the wonder, magic and superstition of the Philippines, and gives American readers a new appreciation for their culture. The stories for children and folk tales are divided into five originating groups. Tinguian, Ingorot, the Wild Tribes of Mindanao, Moro and Christian; Christian here referred to the culture of people who had accepted the Christian faith, and it was this personal choice that informed their tales.